I was a junior when I first heard about Facing History and Ourselves. I didn't think much of it except that it was just another history class. All I heard about it was that its main focus is on the Holocaust. Why would I want to sit here and just listen to the teacher go on and on about something I already learned? 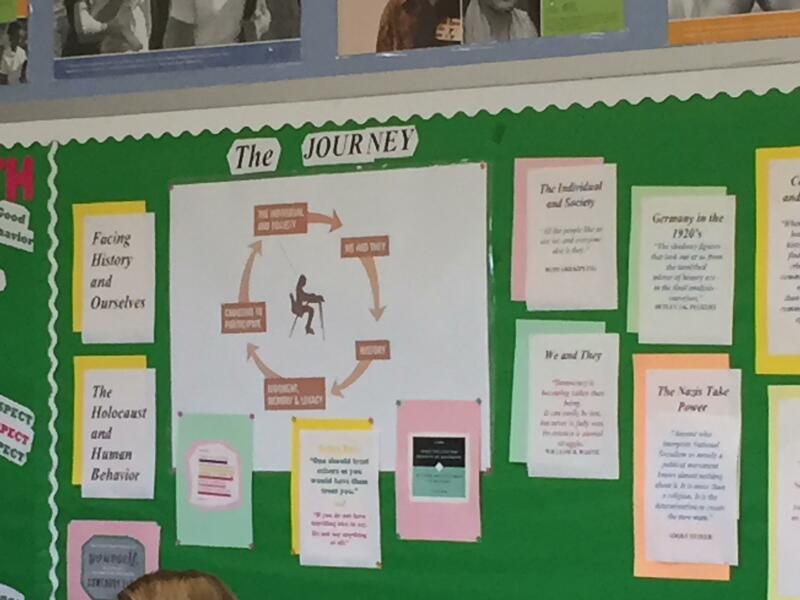 My negative thoughts on the class quickly vanished when Mrs. Mclaughlin-Hatch introduced the circle of The Journey, which included five different stages. I soon learned that this was more than just the Holocaust, it was about me; it was about us. We and They: This stage was all about different groups/communities. It addresses how people are constantly discriminated by society because of appearance, class, and identity. I was left out plenty of times, so I try not to hurt others this way because I know the feeling. History: I became more informed about the Holocaust. There was so much more to the genocide than the basic things we were previously taught. Anyone can have power; it's all about the amount given to them and how they use it. Adolf Hitler gained so much control and he used this authority to do wrong by six million Jews. So much could have been done to prevent this before it got worse, but people only knew how to stand by and watch. Judgement, Memory, and Legacy: We learned about those who survived. I never knew some people kept diaries during the Holocaust; I learned a lot from their writings. These people had hope and hope kept them going. Sometimes people today go through little things and give up. Their lives will always be remembered. Their struggle, their hope, and their memories will never be forgotten. We must always carry the Holocaust with us. Choosing to Participate: This stage is all about what you decide to do when a tough situation presents itself. Would you be a bystander or an upstander? I know for a fact that I would be an upstander. I know that I will always try my very best to do the right thing, to help those in need. To give does not mean I need to receive. It always leaves a good feeling in my heart to know I have made someone's day. The most valuable part of this course was gaining a great amount of knowledge about accepting yourself and others. It’s all about how you perceive yourself, how you feel about you. People’s opinions should not always take a toll on you; you live for yourself, not others. This is very important because accepting who you are is a big part of life, and so is keeping an open mind about people and respecting who they choose to be. Facing History and Ourselves has made such a difference in my life. This class showed me how to find myself. This course pushed me to be more selfless, to do the right thing without any hesitation. I will fight for myself and for those who can’t. Here's my advice to next year’s Facing History students, “Whoever saves one life saves the world entire.” Soon enough you will all know what that means and why it is so important. That is the most important advice I can give, but there is more. I cannot stress this enough: participate and keep an open mind. Allow yourself to be an accepting person and don’t ever become a bystander to anything. I hope you enjoy this journey as much as I did. How do you explain Facing History to your students? Share your descriptions with us! Melissa Spinola is a 2016 graduate of Southeastern Regional Vocational Technical High School in South Easton, MA. She plans on attending Johnson and Wales to study criminal justice or liberal arts. She loves to travel and write stories about places she's been.